Culture Minister blasts far-left NGO umbrella organization for its ties to Arab ex-MK convicted of aiding jailed terrorists. 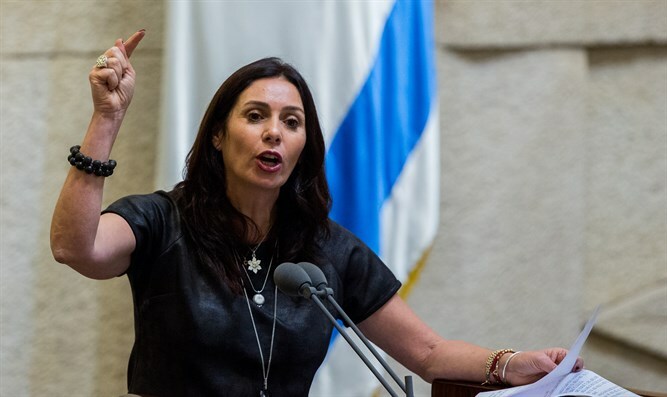 Culture Minister Miri Regev blasted the New Israel Fund - an umbrella organization for radical far-left NGOs – on Monday, accusing the fund of ties to a former Knesset member convicted of aiding jailed terrorists. Regev’s comments came in response to a report by Israel Hayom which claims the NIF helped advertise a farewell party for the disgraced ex-MK Basel Ghattas (Joint List). Ghattas was convicted in March in a plea bargain agreement after he was caught sneaking cellular devices in to jailed terrorists and carrying messages to and from Hamas-affiliated terrorists held in Israeli prisons. In April, Ghattas was sentenced to two years in prison. Following the report, Regev told Israel Hayom that the revelation validated her claims against groups affiliated with the NIF, which she says have funded incitement against the Jewish state. Worse still, said Regev, the NIF is now apparently giving direct backing to terror supporters.